Our Jumbo Pompom Fringe is just the thing you need to add pop to your next project! This fun fringe features fluffy pom poms hanging from a braided trim by two sturdy threads. You can add this funky trim to your home décor or accessories! Sew it onto a blanket or comforter for a fun and colorful gift, or trim your lampshade with it for a unique light accessory. 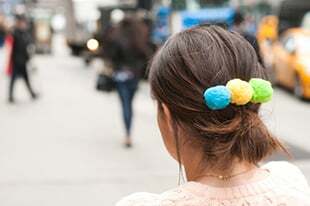 We even used this trim for a hair accessory DIY and created a funky Pom Pom Comb! Available in ten colors.